Washington (CNN) - The number of Americans who think the economy is in poor shape has risen to its highest level in two years, according to a new national poll. A CNN/Opinion Research Corporation survey released Friday also suggests that the spike in gasoline prices may be a contributing factor to that rise. Eighty-four percent of people questioned in the poll rate current economic conditions in the country as poor, up nine points from January. "In January, 24 percent of the public thought that economic conditions in the country were good - not a great number, but the highest it had been since 2008," says CNN Polling Director Keating Holland. "Now that number has dropped to 16 percent." 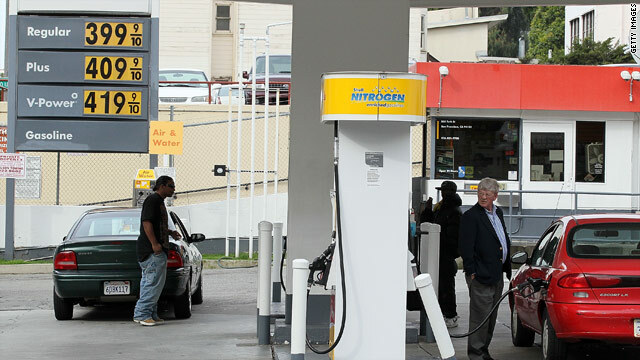 The survey indicates that two-thirds of all Americans say that rising gas prices have caused a hardship for their families, and nearly eight in 10 think that it is likely that the cost of gasoline could hit $5 a gallon by the end of the year. Fifty-six percent questioned say they support using the government's Strategic Petroleum Reserve to put more oil on the market to combat rising prices. "Gas prices, not surprisingly, are hitting lower-income Americans the hardest – 77 percent of those who make less than $50,000 say that gas prices are causing a hardship for them compared to 54 percent of higher-income Americans," adds Holland. But gas prices are not the only economic headache for the American public. According to 38 percent of the respondents to the survey, unemployment is the top economic problem, followed by the deficit at 28 percent. Gas prices are third, at 19 percent . The CNN/Opinion Research Corporation poll was conducted March 11-13, with 1,023 adults nationwide questioned by telephone. The survey's overall sampling error is plus or minus three percentage points. CNN Deputy Political Director Paul Steinhauser contributed to this report. Gas prices are insane I drive 150 miles a day just to get to and fro work. This is like putting the cart before the horse. First come high prices and then the pesssimism and why people are not going to be spending their money. I still see the fools buying SUVs as gas prices continue to rise. Wow – 84 + 24 is over 100???? When was the poll taken to give the 84%? It does not matter – it seems like the TOP – who get the TAX BREAKS – are NOT complaining!!!! The middle class will suffer more now – while the RePUKES cut unions – raise taxes on the poor and eliminate everyone’s RIGHT to bargain for the bread on their table. The RepubliCAN’Ts do not want a middle class!!! In order to be RICH, you have to have POOR and that is what we’re being reduced to. I guess the MIDDLE was trying to creep up to the top and the RICH was NOT having it – HENCE – strip them of EVERYTHING – raise food prices – raise gas – cut salaries – raise medical benefits while we TAKE AWAY health care for all – and last but not least, don’t give them the RIGHT to protest or demand better!! GET THE PICTURE???? I guess this is the RepubliCAN’T’s way of trying to make President Obama a one-term president!!! Little do they know, we’re smarter than that and our GROUND ZERO is WI!!!!!! $3 is the majic number andything over the economy slows. At $4 it stops. It just takes a while tho "trickle down". It's not rocket science. Peiople that spend 100% of their income on goods and services have less to spend now. When people quit buying oil stocks this crap will end. Note to all the Greedy Old Parasite whiners: Obama does not control gas prices. If you have a problem with those prices take a good hard look at how Wall St. speculators drive up the price. And then start supporting, instead of opposing, regulation of Wall St. to prevent or at least limit this sort of nonsense. Gee, who spent time and money on conducting this poll? Gas prices may be driving the middle and lower income recovery into the cellar, but they are not caused by a poor economy, a whacko in Libya, the scent of unrest in the MIddle East or President Obama. They are caused by long term futures in the commodity market being bought and sold by faceless fools for the people who own our government. The uber rich become richer when the price of oil rises to the level they bet on – we're not talking just big oil – we're talking about ALL the extremely wealthy folks Republicans just insisted needed yet another tax break. Geez, the oil companies and speculators making billions again.....do we really need to subsidize them? Everyone knows the reason is over "uncertainty" in the Middle East, even though none of our major sources are threatened. Libya is ranked 17th in production, Egypt was merely a shipping/pipeline terminus. Doesn't anyone feel a sense of outrage over huge hikes in price for no real reason, or is it only acceptable when a Democrat is in the White House? The last time we had prices like this, we had Tweedledum and Tweedledee ( Bush/Cheney) running the country: no screaming fits from the Right wing then. Stop the speculation. That's the primary reason for gas prices going up. Wall Street is the culprit as usual. America does not have to worry, once our president finishes his basketball brackets, going to the correspondents dinner, playing golf, giving all of our money to the corrupt unions, destroying our health care system, apologizing to the world for the Bush administration upholding its constitutional duty, taking a trip to South America for Spring Break with the family, playing golf, entertaining the president of SEIU/ACORN at the White House and destroying our ecoonomy, vacillating about Libya and the budget, he will jump right on that. He is a very busy union toady, you know. It is about greed abnd caused by the same thing that sent us almost over the edge 2 years ago – speculation. They are running up the price again speculating. They do thast to us over and over and no one stops them.. Instead of complaining because the President likes basketball and chose to take a little while out of his busy day to predict winners, why don't you complain about the speculators and the gas companies????? That is what Fox entertainment betwork should complain about – something important for a change.